Root-to-leaf cooking has long been an obsession of mine. There's nothing I love more than using as many parts of my produce possible & finding the most delicious ways to use them. I have a lot of "fridge anxiety" where I'm constantly worried about what is about to go bad at every minute. It's a first world problem, but I'm very in tune with my fridge and what's happening inside it. (I even have a fridge list I update weekly, I know.) As much as I love it, I’m always in the mood. I can't promise you I always keep my zucchini tops or radish greens to "braise", but there are a few tried and true waste-not ideas I can’t live without. One of my favorites is by far broccoli stems. They are such a versatile vegetable that most people throw away entirely. (Such a shame!) This salad feels like a victory. Like an amazing meal out of the random things left in your fridge. Not to mention, a 2-for-1 bargain that you’ll want to tell everyone about. This Winter salad is perfect for the colder months when you crave something heartier than a delicate spring green. It’s so simple, and I promise you’ll start craving broccoli stems. Life-changing salads is not a phrase I’d use often, but this one truly is. Radish/Turnip Greens = sauté with lemon juice, olive oil, salt and pepper. top with shaved parmesan. Fennel Fronds = add raw fronds to salads, avocado toast, etc! Also amazing in tuna or potato salad. Cauliflower hearts = perfect for soups, or seared with olive oil, sea salt and freshly ground pepper. Almond Pulp (from making almond milk) = Granola! Mushroom Stems = perfect for vegetable stocks or soup! 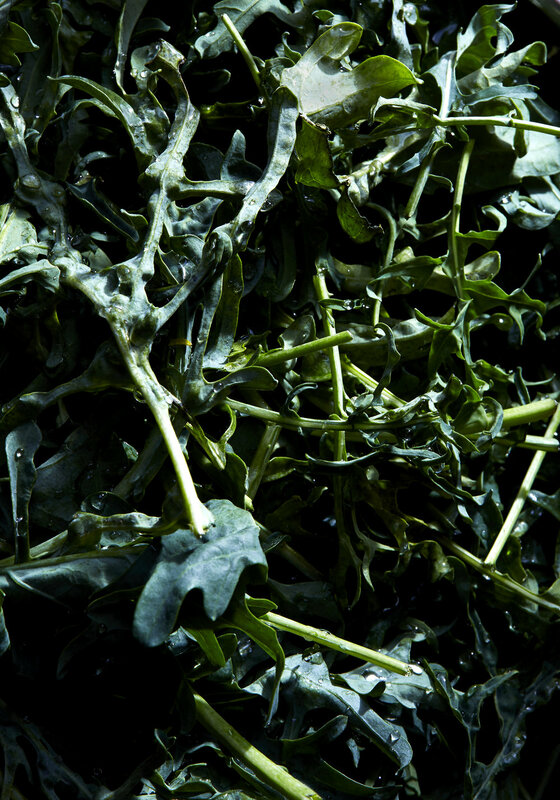 To prep the broccoli stems: shave the knobby, waxed skin from the sides with a peeler. Then, using a mandolin, shave the broccoli stems thin into a serving bowl. Continue until all stalks are shaved. Set aside. To make dressing: add garlic clove, lemon, vinegar, salt and pepper to a small bowl. Mix together well, then add olive oil in a steady stream until emulsified. Toss the broccoli stems with dressing and mix until well coated. Shave the pecorino atop & season with sea salt and freshly ground pepper. Serve immediately, but this salad will last in the fridge (covered) for about a day or two.